No Doubt offer up a curious but highly effective mix of rootsy rock steady reggae, skater ska, and US style new wave power-pop circa `78. My 11 year old daughter is already a huge fan having abandoned sugary boy band pop for the slightly grungier delights of Avril Lavigne and Good Charlotte amongst others and although No Doubt don`t quite fit the same bill, I think she senses that they`re closer to the real mcCoy than the insipid offerings of, say, Pop Idol. Of course, as you`ll see on this disc, No Doubt are huge in the US though even their recently released greatest hits album failed to make waves here in the UK. But enjoyment of this band needn`t be limited to maturing teeny-boppers. They`ve been around for ten years or so, and it nearly brings a tear to my eye that the musical tastes of both Father and Daughter have finally met on genuine middle-ground. (I get all the punk, rock-steady and ska I crave and she gets a dose of sugary pop to make it all the more palatable…). So onto the content. A straight forward no nonsense stage set up with a single giant video screen at it`s centre, and a catwalk style stage thrust into the sizable audience. A band so tight it hurts, and Gwen Stefani energetically taking centre stage at all times singing with the voice of an angel - and looking every bit like a punkess Bardot. The bass and drums are tight enough to rival reggae masters Sly and Robbie, and the Rico-like slide Trombone adding a great reggae counterpunch to the rock guitar and early 80`s sounding electronic keyboards. And it all works brilliantly - from start to finish. 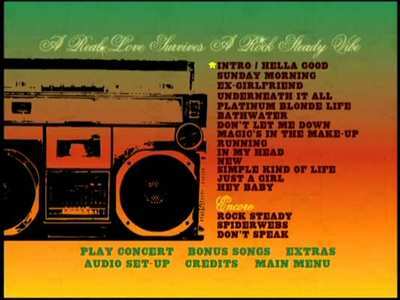 Standout tracks are the glorious Reggae of `Sunday Morning` , the Rock Steady anthem `Underneath it all` and `Don`t Speak` , the final number in this lengthy set which sees the whole audience take over the vocal segments. Standard 4:3 Ratio, and filmed with somewhere in the region of six or seven HDTV Digital cameras, the footage is crisp and stylish. For a while I thought this was shot (like many shorter promos) on 35mm or 16mm film but I think the stylised filmic look has been achieved using a video editing trick where every other field (2 fields per frame, 25 frames per second) is removed and the previous frame is doubled up. Whatever the case, it`s a visual treat. The visual quality of the many extras are extremely variable but this is certainly forgivable given the sheer quantity and nature of them. Available in both Dolby Digital Stereo, Dolby Stereo 5.1 and DTS 5.1, the audio is of a superb quality. 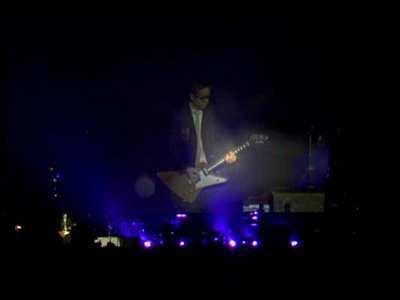 The concert mix is magnificent and every nuance of the bands performance can be properly enjoyed. Some of the audio on the extras is, by stark contrast, almost unacceptable but again, perhaps forgivable given the context and quantity. Where to start!? 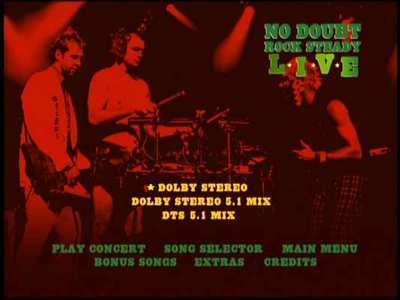 This DVD is packed with extras including fly on the wall footage leading up to the concert, a look around Gwen Stefani`s house as she prepares for another promotional outing, interviews aplenty (some with almost inaudible muddy sound) and many other features showing just about every aspect of the bands personal and professional lives. It`s all fascinating stuff and reveals a band who are incredibly professional about what they do and yet who still retain an earthy awareness of their musical roots. If there`s an ever pervading whiff of slight `calculation` to the whole affair, and the distant sound of record company executives rubbing their hands together in delight then I think we should forgive it just this once, especially when you consider the effort and value that this disc represents. This is what live music DVD`s are all about - or at least, should be. This is a disc that no fan should be without and it`s a great representation of the band for anyone interested in checking them out. From the second the band rise out of the front of a 50 foot catwalk style stage thrust through to the final number of an incredible encore, this DVD is sheer dynamite. 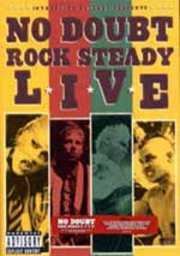 So many live music DVD`s seem to dilute the excitement of the real deal, but this crackles with energy from start to finish.